Original beef brand, raised and produced in Tokachi, Hokkaido. From Japan to America, extending our vision, our dream. The spirit and commitment of the Nobels Group is reflected in everything we do, from production to sales. As producers of beef and raw milk products, the Nobels Group is one of Japan’s top companies in terms of both production scale and technological capabilities. 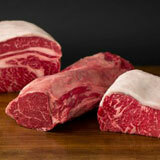 At Nobels Food, we process and sell beef from cattle raised and nurtured on farms operated by the Nobels Group. 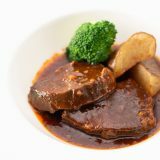 We offer two original beef brands, Tokachi Herb Beef, which is limited to the Japanese domestic market, and N34, which we provide to professionals in Japan with sales also planned for the United States (US sales launch timing TBD). Messages from three members of Nobels Food involved in management and sales. Discover the Nobels Group passion for and commitment to beef production, and learn about the appeal of our new beef brand N34. オリジナルブランド牛肉「N34」の販売開始 | Sales of N34 start in Japan and America!